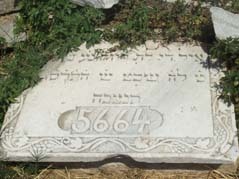 A tomb at Selanica Hortaci Mosque. Jews had no more than a walk-on role in the story of modern Greece’s appearance on the international stage. Even as late as 1912, Jews made up the largest ethnic group in Salonica, Greece; and, Saturdays, which is the day of Shabbat, used to be a holiday on the pier. A few Jews were wealthy businessmen; however, many others were porters, tailors, street vendors, beggars, fishers, and workers in the tobacco business. The marks remaining from those days to our times are the gravestones with inscribed with Hebrew writing, which are scattered around.